Wichita Grand Opera opens a new production of Puccini’s masterpiece Turandot on Friday, August 28, 2015, at 7pm in WGO’s home theater of Century II Concert Hall in Wichita, Kansas. WGO makes its debut at Overland Park’s Carlsen Center with a second performance of the production on Sunday, August 30, 2015 at 3pm. The cast features stars from the world’s most prestigious opera houses, and will be conducted by European maestro Martin Mazik. The production is directed by American director Shayna Leahy, with sets designed by Margaret Ann Pent and executed by European scenic artist Stefan Pavlov, costumes by Charles Caine and John Leymeyer, and lighting by Sean Roberson. Puccini was the last of the “Italian Masters,” and he took the term Grand Opera quite literally. Everything about the production is grand: the orchestra that must be assembled to perform it is enormous – nearly Wagnerian in numbers, and the massive chorus and dancers virtually become the opera’s leading character. Turandot is an impressive undertaking for an opera company, and for the audience in attendance. 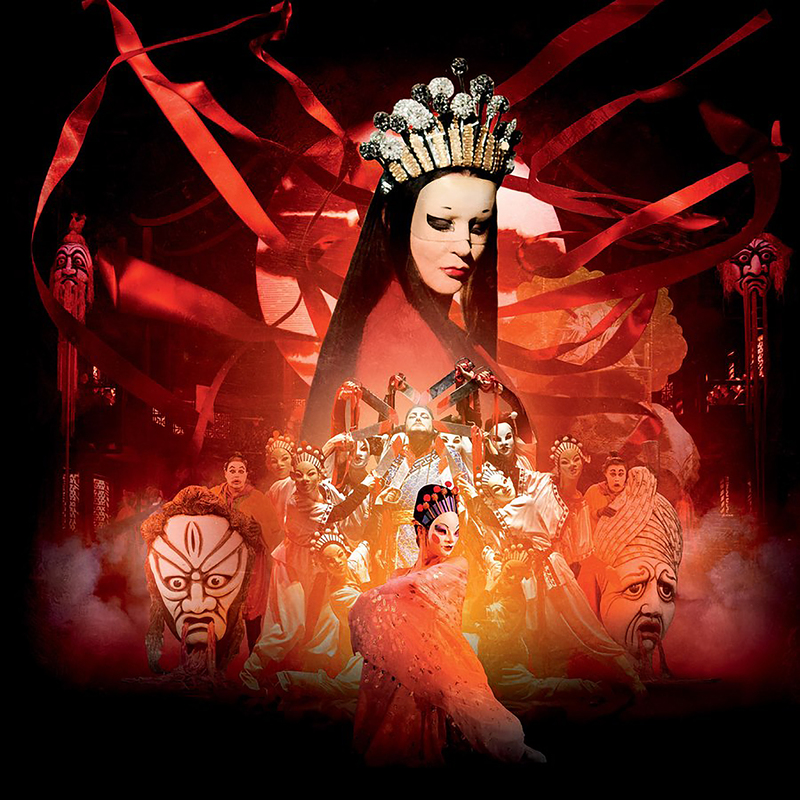 The bright colors, music, and special effects of Turandot bring Puccini’s vision of the exotic Orient to life. Set in ancient times, Calaf, a vagabond prince of a conquered people, finds himself in Peking. He had heard tales of a princess whose father is eager to see her married. Princess Turandot resists the idea and poses a challenge of three riddles to her suitors. The penalty for an incorrect answer is a swift and merciless beheading. Though the townspeople warn him against it, one look at Turandot is all it takes for Calaf to fall madly in love with her. After correctly solving her riddles, he impetuously offers her his own riddle: if she can discover his name before dawn, he will agree to be executed. As day begins to break, Calaf sings the iconic aria “Nessun Dorma,” (No One Sleeps) – which has reached #1 on many pop and classical charts – as he knows he has won his challenge. Brazilian-born tenor Ricardo Tamura tackles the difficult yet breathtaking role of Prince Calaf in his Wichita Grand Opera debut. Having rocketed to international stardom following a thrilling appearance in the title role of Verdi’s Otello at the renowned Arena di Verona, Tamura comes to the WGO direct from the Metropolitan Opera, where he tackles heavy-hitting tenor roles such as Cavaradossi (in Puccini’s Tosca) and the title role of Verdi’s Don Carlo. Kansas native Samuel Ramey – a living legend in the opera world and the most recorded bass in history – returns to the WGO stage, starring as Calaf’s father Timur, the blind and deposed king of a conquered people. Adding to his repertoire of accolades, in 2015, Ramey was honored at the 10th annual Opera News Awards and received a lifetime achievement award from the National Opera Association. No stranger to the WGO stage, Ramey has starred as Mephistopheles in Gounod’s Faust (2008), Baron Scarpia in Puccini’s Tosca (2007), and opposite fellow Kansas natives Joyce DiDonato and Alan Held in WGO’s 10th Anniversary Gala Concert (2011). Maestro Martin Mazik returns to the podium as WGO’s Principal Guest Conductor. Maestro Mazik was appointed Principal Conductor of the Slovakian National Opera in 1996, making him Europe’s youngest chief conductor at the time. Currently, he is one of Europe’s busiest conductors, leading over 200 performances per year across Europe, Japan, and the U.S. His experience will be vital as the WGO cast, chorus and orchestra navigate Puccini’s thrillingly complex music. Korean soprano Yunnie Park makes her WGO debut as Timur’s servant Liu, who loves Calaf and takes her own life rather than reveal his name to Turandot. Throughout the opera, Puccini masterfully juxtaposes beauty and brutality, giving Liu two gorgeous, sinuous arias as she is tortured by Turandot’s henchmen. Comic relief comes in the form of Turandot’s jaded ministers of state, Ping, Pang, and Pong (Marcus DeLoach, Brian Frutiger, and Brian Yeakley). The role of the Mandarin, which opens the production by announcing Princess Turandot’s decree, is sung by Gregory Brumfield. Stage Director Shayna Leahy has mastered the art of marshaling massive forces onstage while illuminating the intimate motivations of her characters. She has previously directed WGO productions of epic works such as Aida, Otello, Il Trovatore, and Madama Butterfly. The WGO Orchestra is led this year by newly-appointed concertmaster Evgeny Zvonnikov, as the WGO adds performances in all corners of the state, including WGO’s first appearance in Overland Park’s magnificent Carlsen Center. Tickets are $95, $60, or $40, with student, group, and corporate discounts available. Season Subscriptions are also available, saving up to 15% off full ticket price. In addition, WGO offers a special “Day at the Opera” package including backstage tours for student groups, saving as much as 75% for groups of 20 or larger. Tickets for this or any other WGO production in the 2015 Season can be purchased through the WGO Box Office at Century II, by phone at (316) 262-8054, online at www.selectaseat.com or at any local Dillons Customer Service Select-A-Seat outlet. For more information, visit www.WichitaGrandOpera.org.